1. Starbucks' big day: Starbucks (SBUX) is closing around 8,000 of its company-owned US locations Tuesday for racial bias training. About 175,000 employees will participate. The company announced the plan soon after two black men were arrested in a Philadelphia Starbucks while waiting for a friend. The incident sparked a public outcry and prompted an apology from CEO Kevin Johnson. The training is one step in the company's reform effort. A new policy allows Starbucks customers to spend time in stores and use the bathroom without making a purchase is another. 2. Italy drama: Political uncertainty caused the benchmark Italian stock index to drop another 3% on Tuesday. President Sergio Mattarella on Sunday refused to accept the nomination of a euroskeptic finance minister, prompting the anti-establishment Five Star Movement and far-right League party to give up trying to form an administration. The country's uncertain future has unsettled investors. The gap between Italian and German bonds, which indicates how confident investors are about Italy's ability to repay its debts, has widened further. "New elections are now more likely ... and the election itself [is] in danger of turning into a de facto referendum on Euro membership," said Kit Juckes, a strategist at Societe Generale. The euro dropped 0.8% against the US dollar to $1.15. 3. 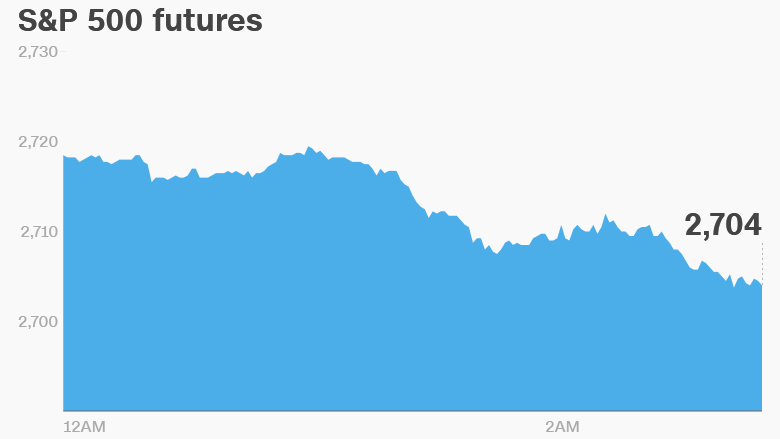 Oil prices slide: US crude futures dropped 2% on Tuesday, the latest in a series of losses. Oil was trading at $66.50 per barrel. Prices have plunged after Saudi Arabia indicated that OPEC and Russia could pump more oil in order to make up for lost supply from Venezuela and Iran. OPEC producers and Russia are due to meet in Vienna on June 22 to discuss easing self-imposed supply caps, which have been in place since 2017. The price of Brent crude, the international benchmark for oil, was $75.30 on Tuesday following several days of losses. 4. Pret sale: The owner of Krispy Kreme and Keurig has purchased UK sandwich chain Pret A Manger. Investment company JAB acquired Pret from private equity owner Bridgepoint and minority shareholders. The price was not disclosed. 5. Global market overview: US stock futures indicated a lower open for markets following Memorial Day weekend. Most major European and Asian markets were lower. The Dow Jones industrial average and the S&P 500 shed 0.2% on Friday, while the Nasdaq added 0.1%. 6. Earnings and economics: HP (HPQ) and Salesforce (CRM) are set to release earnings after the close. The latest reading of the Conference Board's Consumer Confidence Index will be published at 10 a.m. ET.